Peter Ellenshaw Handsigned & Numbered Limited Edition Giclee on Canvas:"View at Lake"
Ellenshaw regarded Walt Disney as a source of inspiration, a wonderful executive, and over the years, a good friend. "Walt had the ability to communicate with artists", recalls Ellenshaw. "He'd talk to you on your level - artist to artist. He used to say, "I can't draw, Peter". But he had the soul of an artist, and he had a wonderful way of transferring his enthusiasm to you". One of Ellenshaw's first Disney projects upon his arrival at the Studio was to create a conceptual rendering of something called "Disneyland". Ellenshaw went to work painting an aerial view of the proposed park on a 4' x 8' piece of fiberboard. 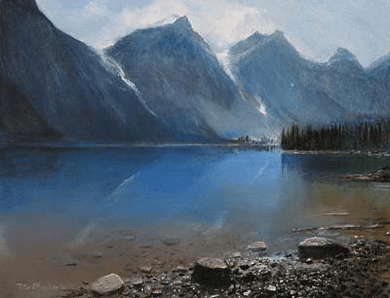 The painting was then used by Walt Disney to help introduce television audiences to his new project, while simultaneously using the painting to attract backers on this exciting new concept in outdoor entertainment.